Darly: Oh my god. This room has "Please God don't make my son a fag" written all over it. Q: Is "Leaving Normal" based on a book? 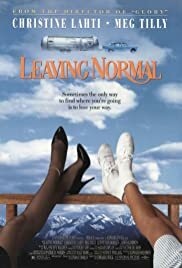 Q: Any recommendatios for movies similar to "Leaving Normal"? The movie had a lovely opening with Meg Tilly confiding to a series of fellow passengers on a Greyhound Bus, that she is sure her life was about to change, even though she was marrying a person she did not know very well. About two minutes later, she is back out on the road, illusions shattered. Her character(Marianne) bumps into Christine Lahti, who is also ready for a change, after burning just about everybody who has ever be-friended her. So, Marianne-Pollyana and the queen of bitterness take off for Alaska. Some of the surprises include a poet-trucker, and Christine's dancing abilities.